Riding along on a board - behind a horse! 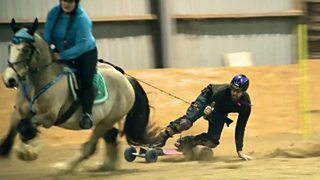 The thunder of hooves, the spin of wheels, average speeds of 28mph and spectacular wipeouts - welcome to the world of horseboarding. Mike Bushell goes along to investigate the sport which, in the eight years it has been going in the United Kingdom, has grown to a championship involving 36 teams across nine rounds. In 2016, for the first time, there is also a team competition for the juniors. If you want to find out more about horseboarding in the UK, visit their website.